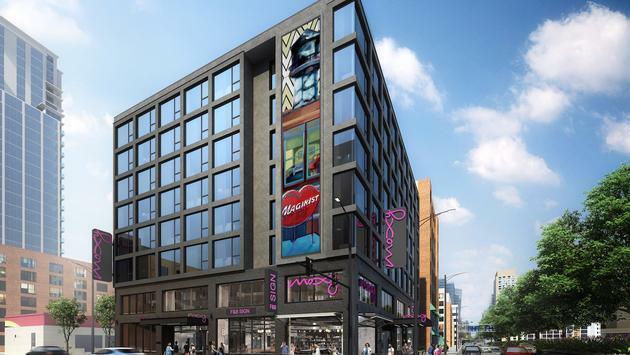 Marriott International’s bold lifestyle brand; Moxy Hotels debuts in Chicago, USA. Moxy Chicago Downtown now welcomes its guests in the dynamic River North neighborhood of Chicago. Developed by White Lodging and Friedman Properties, and managed by White Lodging, the 156-bedroom hotel, situated on the corner of Grand Avenue and LaSalle Drive, fully embraces modern fun-hunting travelers with its spirit and style. Designed by Texas-based Flick Mars and integrated global design firm DLR, the public and private areas follow Moxy’s design-forward sensibility with tech-enabled bedrooms and vibrant lobby, lounge and bar spaces. Exceptionally efficient guest rooms provide everything travelers need and nothing they don’t. These thoughtful modifications make room for things that matter more, like the 49” Smart TV and a sumptuous bed with fine linens and exceptional pillows. Moxy Chicago Downtown will be home to Zombie Taco, which is a 24-7 food truck inspired concept with global flavors serving tacos, healthy bowls, burritos, and other fresh, made-to-order items. Zombie Taco will be the ideal stop for lunch, the perfect fuel to keep the night going, and everything in between. Need your taco to go? Try the walk-up window located on LaSalle for quick convenient service. For those looking for other food options, head to Moxy Pick-Ups in Bar Moxy, for locally roasted coffee, baked goods, freshly prepared grab-and-go items, and locally sourced snacks from unique brands. Αναρτήθηκε από geop στις 6:42 π.μ.